The Political insider is reporting that Julian Assange is announcing that Hillary Clinton and her State Department were actively arming Islamic jihadists, which includes the Islamic State (ISIS) in Syria. Big freaking surprise. Just like CSIS. 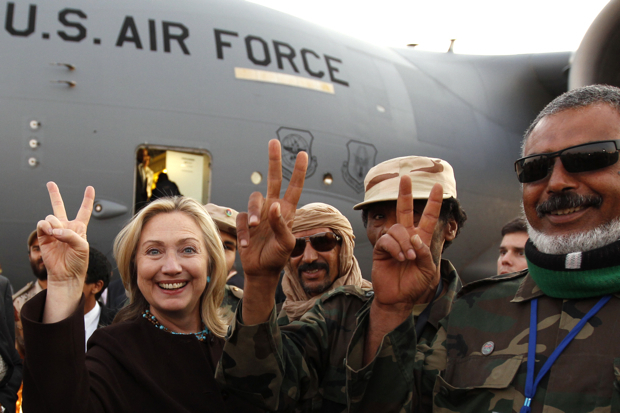 "In Obama’s second term, Secretary of State Hillary Clinton authorized the shipment of American-made arms to Qatar, a country beholden to the Muslim Brotherhood, and friendly to the Libyan rebels, in an effort to topple the Libyan/Gaddafi government, and then ship those arms to Syria in order to fund Al Qaeda, and topple Assad in Syria. [ Clinton took the lead role in organizing the so-called “Friends of Syria” (aka Al Qaeda/ISIS) to back the CIA-led insurgency for regime change in Syria. Under oath Hillary Clinton denied she knew about the weapons shipments during public testimony in early 2013 after the Benghazi terrorist attack. In an interview with Democracy Now, Wikileaks’ Julian Assange is now stating that 1,700 emails contained in the Clinton cache directly connect Hillary to Libya to Syria, and directly to Al Qaeda and ISIS." WikiLeaks has an online searchable database of Hilary Clinton e-mail archives. If you search Qatar there are tons. Obviously US aid to ISIS would be hidden through shell companies but Julian Assange has outlined the path they took. The US Herald is confirming the story. Don't forget the Clinton Foundation made millions from selling Russian weapons grade Uranium. Russia moves nuclear-capable missiles to NATO doorstep thanks to Hilary Clinton. Update: Here's the paper trail connecting Hilary Clinton to Qatar and ISIS. Just when you think things couldn't get any more entertaining in the American election we get this. Of course now we need to see if its true. My problem with Assange's "revelation is he is like yesterday's news and he needs attention. this gets him that. If it weren't him, I might give it some consideration. My "problem" is if this was the case why wait until now to disclose? Why not disclose earlier when she was not the Democratic candidate? HAD He "disclosed" earlier, Bernie Saunders might have been the candidate. I'm just too suspicious of Assange at this point in time to give it much credibility. Had he disclosed previously, I might have bought it. CSIS was caught giving aid to ISIS. This is what the Intelligence Community does. "Julian Assange, the founder of WikiLeaks, is a controversial character. But there’s no denying the emails he has picked up from inside the Democrat Party are real, and he’s willing to expose Hillary Clinton." You are right in that he should have done it before she was nominated but it's better than waiting until after she was elected. that's the problem, I don't know that those e-mails are "real". so much can be done with computers these days, I don't always believe what is generated via e-mails. Now if it had been with pen and paper, its so much easier to establish authenticity. rolly eyes: Whatever fills your fantasy. The Clintons have been deeply involved in laundering drug money since Mena, Arkansas. Hilary is as dirty as they come. So many people want her president but I for one remember what she did just as the first lady. I do not agree with giving her more power. I also believe they are releasing them this way because of shock factor and plus she already tried to cover it up once by deleting them and anybody else think its funny how people who really object to her are all of a sudden "suicidal:"
Hillary is a skank and a total fraud...but the Billionaires Boys Club love her. Be ready for a fixed election. Is not ISIS a fabrication of the roman church/circus ? No, it's a fabrication of CSIS and the CIA. Sheer coincidence of course that the US Dept. of Injustice dropped the charges against an American arms dealer who supplied/facilitated some of the weapons transferred. Same as with Fast and Furious, the Government goes to a dealer and asks them to do stuff they shouldn't "but it's OK, you're protected, you're doing it for us" and then later on they hang them out to dry and prosecute them to hide their own involvement. That guy sent close to 5 years in court, hundreds of thousands of $$ on legal fee's before Assange released docs proving it was a Government run operation. Any licensed weapons dealer who co-operates with any such request has rocks in his head. With a Phone call these "People" can make you homeless take your children put you in jail or worst have you killed sometimes I don't think Money is the reason.